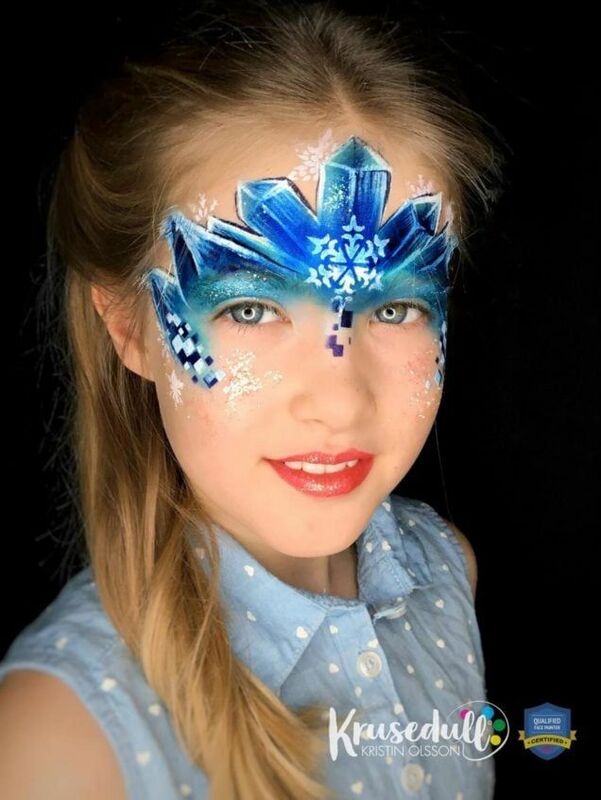 Christmas may be over, but Ice Princess designs are popular all through the winter season! 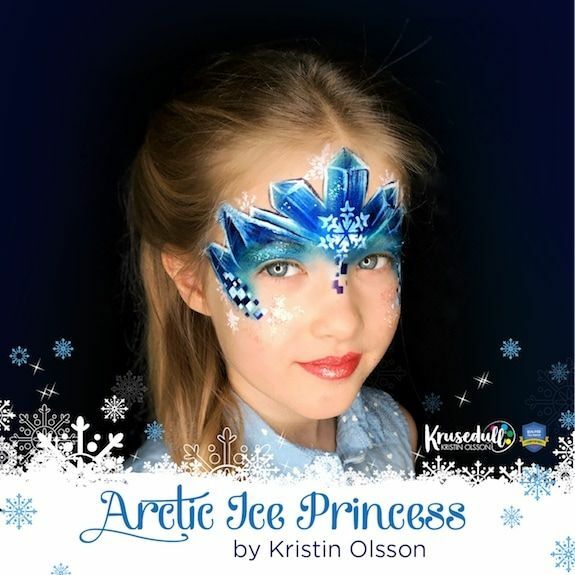 As a special treat for you in the New Year, my right hand Kristin Olsson has made this exclusive step-by-step for the International Face Painting School Blog of her Arctic Ice Princess. 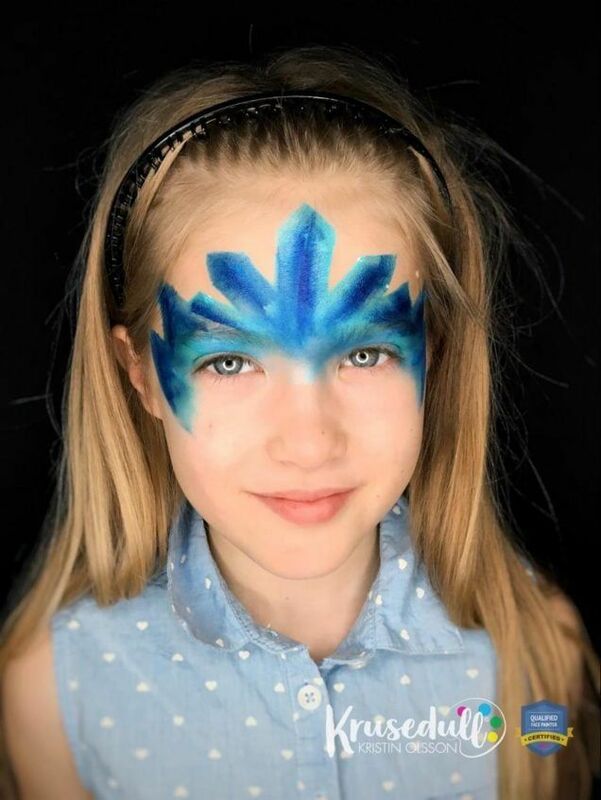 This amazing design was one of her stunning exam works from the School, and it also won the 1st prize in a face painting contest very recently! I am so proud of Kristin — she is an invaluable team member at the School and I can assure you that you will be seeing more of this beautiful, kind and talented lady in the future! Kristin Olsson is 43 years old and resides in Moss, Norway. Here, she lives with her two children Hannah (8) and Nikolai (9), and their cat Bella (4) and 3 kittens (4 weeks old). 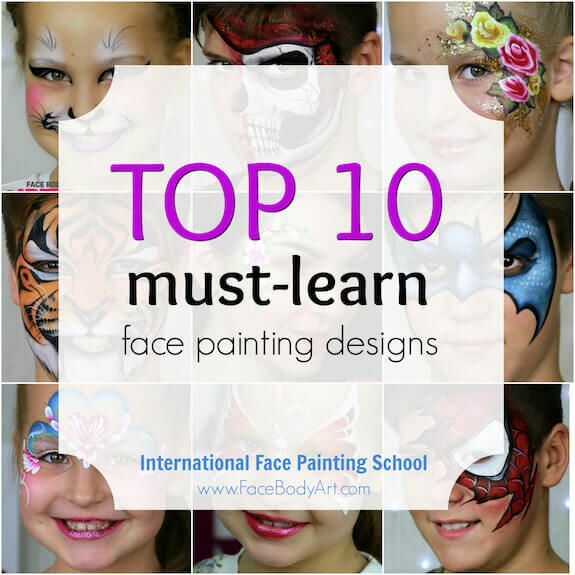 She comes from the world of art and design, where years of practice has now transferred to skills in face painting. Although she loves her work as a graphic designer, it can at times be demanding with projects extending over several months. 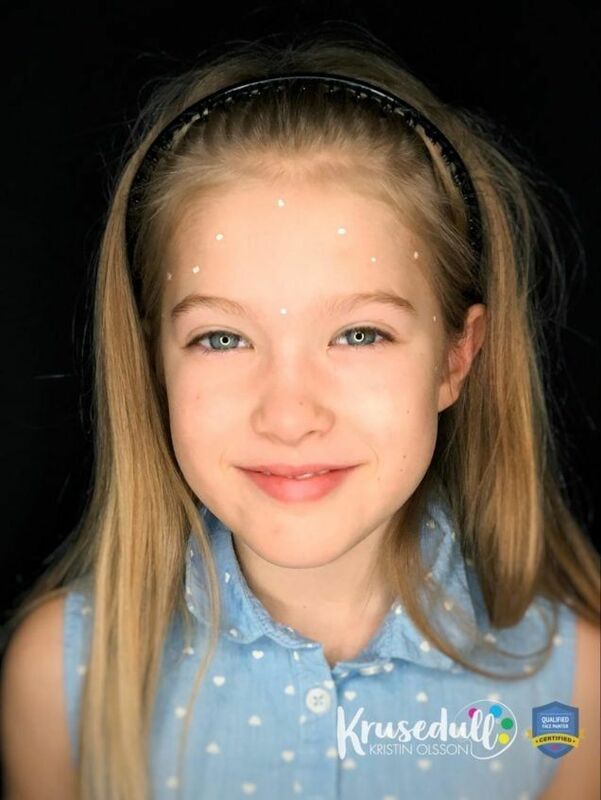 A couple of years ago she started searching for a more playful and fun outlet for her creativity that she could do in her spare time. I was longing to do something a little bit less serious at the time” says Kristin. “My work as a graphic designer is creative, but it can also be a very serious and demanding job at times. Around this time I was going through a time of a particularly tedious assignment. 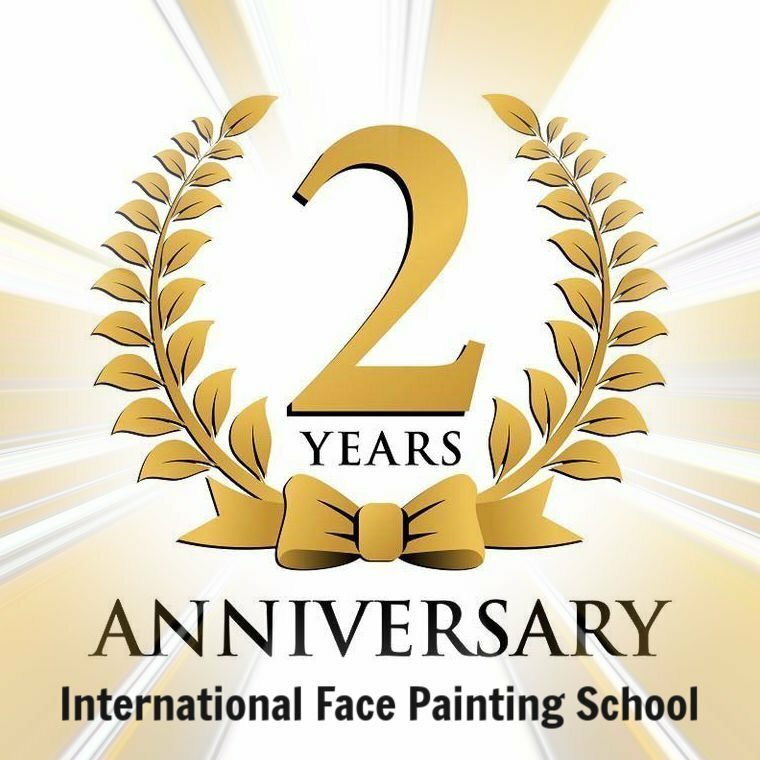 I stumbled across a face painting class conducted by a local clown and face painter, Cathrine Enger Johansen. I instantly fell in love — it was so much fun! 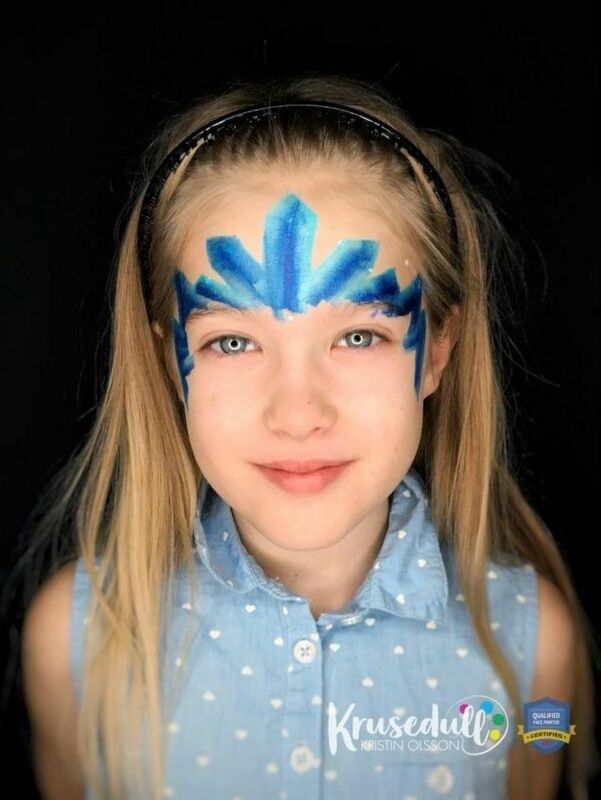 At the end of the face painting class I was asked by Cathrine to come work on her team, and the rest is — as they say — history. In this article, Kristin will not only share with us the step by step photos of her beautiful design, she will also take you through her process when working out a new design. Connect with Kristin on social media so you too can be inspired by her work on Facebook and Instagram. When I first started working on this design, my initial thought was that I wanted to create a completely different Ice Princess/Frozen design from what I had seen before. I was a little tired of painting my usual Frozen crown (I’m sure a lot of you can relate to this) and wanted to change it up and create something different. So I went researching for some photos to get my creativity flowing, and found these amazing crystal formations. Tip: Are you struggling with creating your own design? Check out our “How to create your own original designs” blog post. After doing some research, I usually start by sketching out some ideas. As you can see, my sketches are not very elaborate or well drawn. I usually keep them quite rough, just to get a feel of the placement. When it becomes more clear to me what the placement will be like, I move on to my leg or arm to test out certain elements of the design if necessary. For this design, for example, I knew that I wanted to use a one stroke so that the design can be painted fairly quickly on the job. It was also important to figure out the key to painting crystal formations but at the same time keep a symmetry that would make the design pleasing to look at. For this design it is important to keep the symmetry, so I start out by making marks where I want the ice crystals to point to. 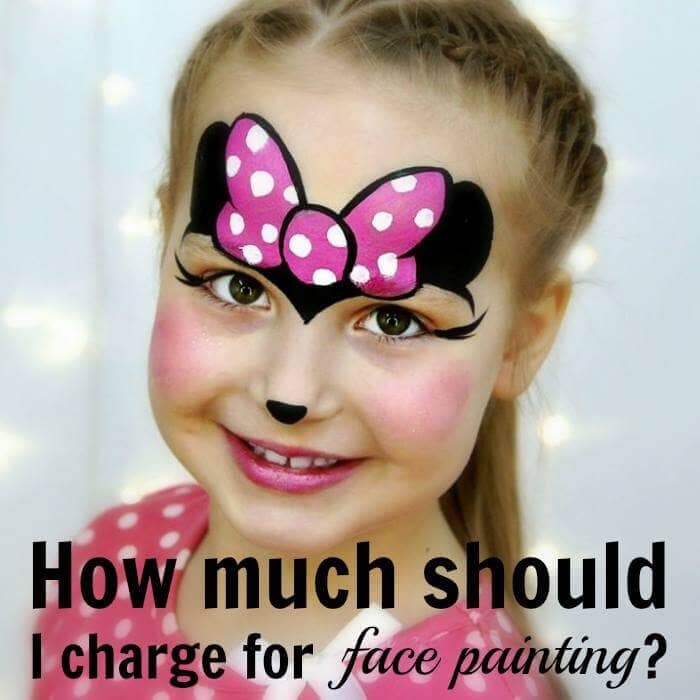 Tip: You can also find helpful checking out our “Secret tips to obtain a flawless design in face painting” blog post. I then move on to painting the main body of the design with a one stroke. I use a small angular brush for this, in this case a Cameleon brush. I make sure that the design points towards the focal point between the eyes to create a balanced and harmonious design. The one stroke paint used here is a homemade mix made up of Global dark blue, Global metallic blue, Global metallic teal, Tag light blue and DFX white. I often like to make my own combinations of colours — this will save you some money as well (unless you are a paint hoarder like I am). I don’t want to use the white side of the one stroke for this, so I make sure to only pick up paint from the darker side of the one stroke. For this next step, I use a petal shaped sponge with a metallic blue paint to go over the eyelids, making sure the transition is smooth. 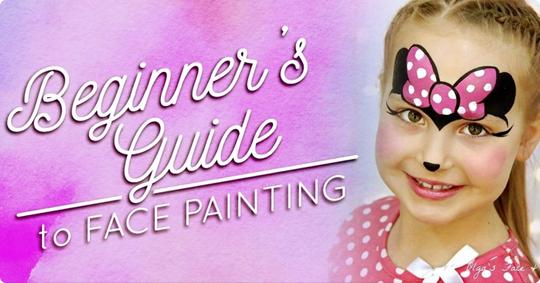 It is best to use a glycerin based paint like for example Superstar or FAB to do this, as they blend more easily. 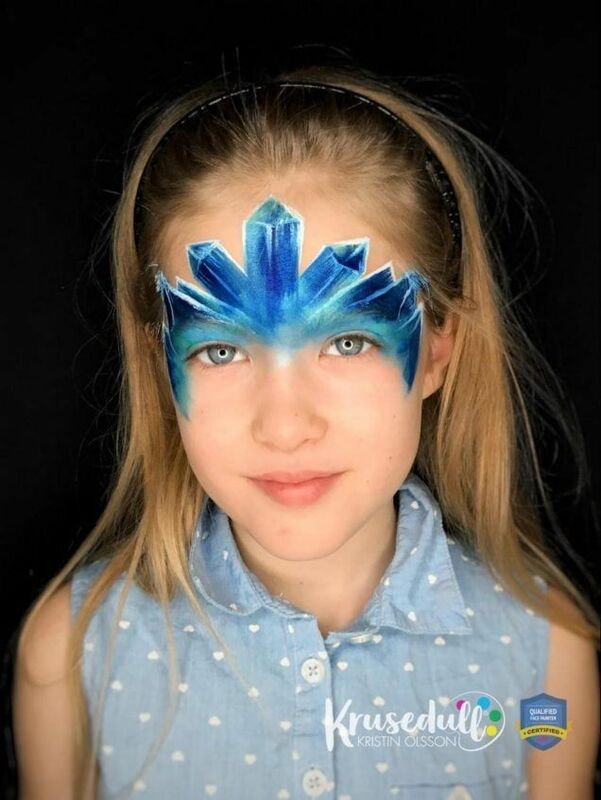 The colours used here, are Superstar shimmer baby blue and Superstar shimmer shiva. Tip: Proper sponge technique is essential to achieve this design, read “How to Choose the Best Sponge” to make sure you achieve the best results! I then outline the design with a white paint — in this case DFX white and a Yellow Loew Cornell 795 no. 2. 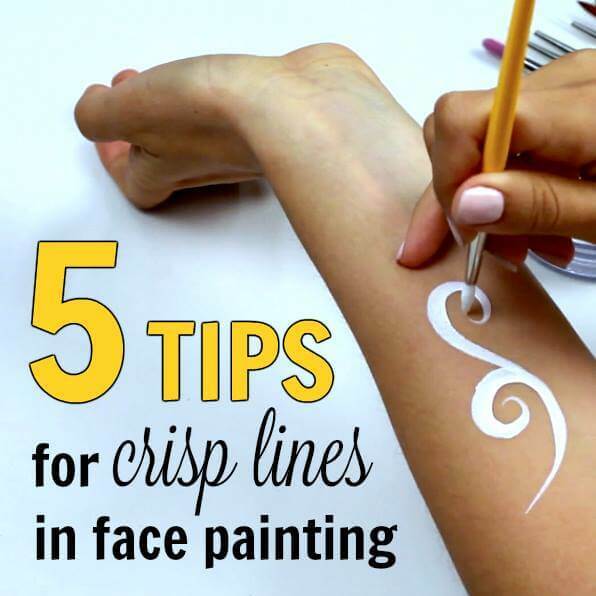 Make sure your brush strokes points towards the central focal point. I also add a little bit of Global dark blue with a small filbert brush in certain places as this helps to create depth and a more 3-dimensional look to the design. Now it’s time to add stencils! The gorgeous snowflake in the middle is by Diva Stencils (no. 00039) and the snowflakes in the background is also by Diva Stencils (no. 00598) For this design I wanted to keep the crystal feel, so Lea Selley’s Graffiti stencils were perfect to add some texture to the design. 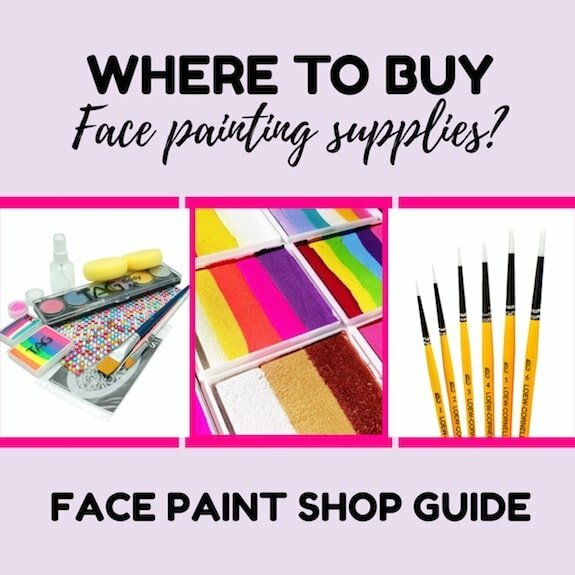 Check out our “How to activate and use face paints correctly” blog post for more info about how to work with your paints properly for best results. 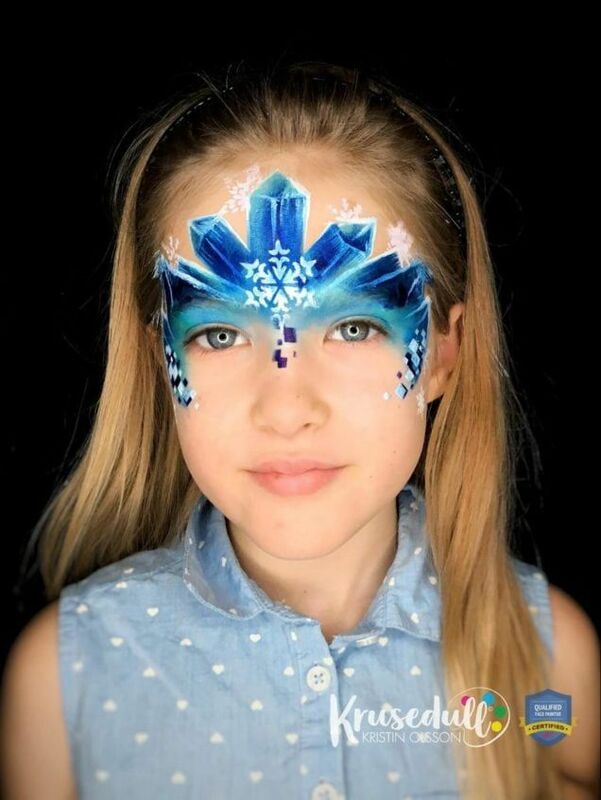 Finish your Ice Princess design with glitter and lipstick. If you don’t have a large snowflake stencil, a custom made bling piece would also look wonderful as a centerpiece. 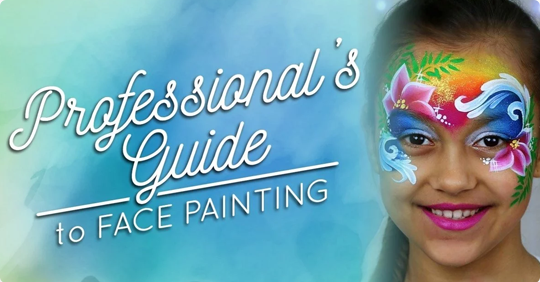 Read our Professional and Beginner’s guides for a complete look into everything you need to know about face painting!